Gilbert holds a B.Sc. Degree in zoology and Conservation from National University of Rwanda. He assisted in different researches such as Biodiversity inventory at some of islands found in Lake Kivu, and Chimpanzee Conservation in Nyungwe National Park / Rwanda, where his responsibilities included overseeing the project and mentoring undergraduate students doing research. 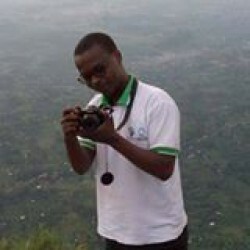 Gilbert carried out a research on the status of Turaco species in Gishwati forest reserve, Rwanda. He is also a trained graphic designer and video editor. Gilbert has three years experience in information management and communications. As Leader of Information Systems and Communications Department, his overall responsibility include to ensure the overall coordination and management of the ARCOS Biodiversity Information Management System(ARBIMS), and specifically, to provide leadership, coordination, management and support ARCOS information systems, communication and outreach activities and GIS resources, working closely with ARCOS staff and partners. Gilbert is passionate for nature and his hobbies include listening to music, swimming and playing basketball.